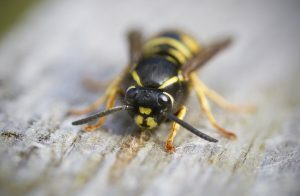 Home » Bees & Stinging Insects » Wasp Facts: How Do Wasps Build Their Nest? How Do Wasps Build Their Nest? Wasps are communal creatures who build nests to breed their young and eventually make colonies. From yellow jackets to hornets to paper wasps; they all build nests for the same purpose. We tend to have a more positive image towards bees vs wasps. Many times, we perceive wasps as obnoxious pests as they can ruin our picnics and build a nest in our homes. But despite their annoying behavior, just like bees, wasps have important roles in the ecosystem. Not only pollinating flowers and crops, but they also control crop pests and harmful insects. Another interesting fact about wasps is how they meticulously build their nest. Although each of wasp builds nests that differ in size, space, and the overall structure, the process of constructing them is typically the same. Common ingredient? Wood! Let’s find out how. Wasps build their nests in just about anything that could provide substantial support to the nest. Usually, they’ll pick a spot that is quiet and concealed, so human activity does not threaten or disturb them. However, wasps nests are sometimes built amidst human life, which can seem problematic. Having decided on a site, the worker wasps then scrape and chew wood particles off fences, branches, cardboard or anything that has a wooden substance to it. After breaking down these wood fibers in their mouth, the wasps then mix them with water and their saliva for enfeebling them, thereby creating soft, sticky paper pulp. The wasps then fly off to the construction site and use their front legs and mandibles to start pouring out this paper pulp on the site’s surface. When the wet fiber paste dries, it transforms into a firm paper foundation from which the remaining nest will then be extended. All of their nests have a common underlying architecture. 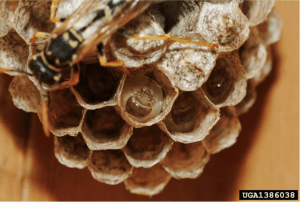 Generally, the nest encapsulates lots of tiny hexagonal cells which serve as rooms for the queen wasp to lay her eggs and breed her younglings. Since the prime purpose of a wasps nest is to breed the young and build a colony, these hexagonal cells require extra protection. Therefore, the wasps keep adding paper pulp in a hexagonal fashion first to create those inner cells. Once this phase is complete, the queen wasp then adds further layers of paper, completely enveloping the cells to protect them against predators as well as harsh weather conditions. Technically wasps inhabit their nests for one season at most which could typically range from a spring towards the end of summer or the beginning of autumn. By autumn the nest usually reaches its peak size as the wasp colony keeps on growing. As winter approaches, the colony starts dying out due to food shortage. Only a fertilized queen survives by usually hibernating in old trees or a house’s basement, roof or attic. Once the entire colony has perished, and the weather has turned less cold, the whole construction process begins all over. Old wasp nests are never reused. It is well-known that yellow jackets, hornets and paper wasps sting if they’re provoked or threatened. Still, it isn’t a justifiable cause to dismantle their nest if it has been constructed in human proximity. It would be surprising to know that wasps nests serve humanity a good purpose! To begin with, hornets and paper wasps prey on insects including plant pests like grubs, caterpillars, and weevils. 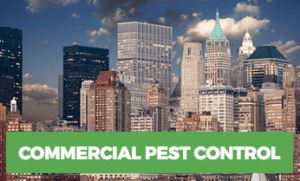 Having them colonize near your home could be beneficial in keeping these pests under control. Moreover, wasps also play a vital role in pollination as they gather food and wood fibers, so they’re also doing nature a favor! These are the breeds that are usually prominent when it comes to human safety since they are more likely to sting you. Another time that calls for you to administer wasp nests is when a family member is allergic to the venom, and a nest is near your house. 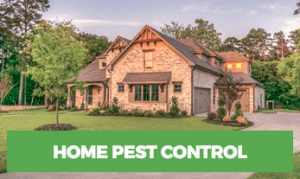 Although they may sting if their nest is disturbed, it would still be better to take the necessary precautions in ensuring your family’s safety. Call a bee removal expert or take matters into your hand by spraying the necessary insecticides, it is your call for judgment. On an ending note, wasps are social creatures who excel at turning raw wood into robust paper homes. Why Are Bees Attracted to Your Car?